SBG CANADA had a phenomenal day Saturday June 6th in Hamilton, Ontario at the Grappling Industries Submission Only Brazilian Jiu Jitsu Competition. 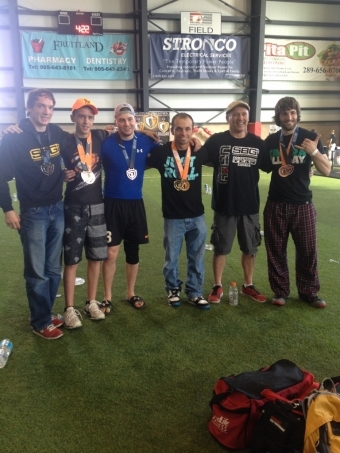 TEAM SBG Niagara had 9 athletes compete: Coach Peshko, Coach Justin, Coach Jermaine, Owen, Harry, Tyler, Joel, Alex, and Allan, and came home with a whopping 12 medals total, 2 Gold, 2 Silver and 8 Bronze. In the last two competitions that the Team has competed in we have brought home a combined 23 medals! Competition Team members as well as regular students coming in before classes to get in extra rolling and drilling time to prepare...students that were not competing “donated” their bodies for the Competition Team members to work with and it paid off. people that have never ever competed before stepping up to test themselves...challenging themselves both physically and mentally just for themselves...willing to out in the work to prepare for the day. Coach Amanda Diggins taking the time to reply to one of our TEAM members who was feeling some anxiety about his first competition...Amanda is a world class competitor and she shared some of her thoughts and experiences that really helped put our athlete at ease. we had some of our TEAM members experience some anxiety and nerves the day of the competition...they trusted me to help them work through it, and it was so satisfying to see them go from doubting themselves to not only believing in themselves, but to improving their performance exponentially throughout the day. TEAM member’s parents staying for most of the long day, even though their son was finished within the first hour, just so their son could stay and support the TEAM. Stephen came out for the whole day to be our TEAM photographer and videographer...it meant an awful lot to have him there taking care of those things for us...we will be starting our YouTube channel shortly and these videos will play a big part in that. hearing from other teams/athletes/coaches about how strong our FUNDAMENTALS are and how relaxed we roll. and to finish, the humility of our TEAM...everyone was just happy to be together competing and representing themselves and the gym in a humble and positive fashion...they are proud of their wins, but everyone was more concerned with cornering, cheering on, and just being there for each other. It is my privilege to coach such awesome, genuine and caring people. This is SBG..You will be OK!